I think the chickadee is my favorite bird. They are so little, and busy, and I love their twitterings and calls. Right now making them is good for me, too. Since they are so small I can make one in two fairly short sittings, and it's not hard on my arm. As much as I love making the larger birds (and people seem to like buying them), making smaller birds makes more sense right now. Thank you so much! I do sell them through an etsy shop and at farmers markets and such. 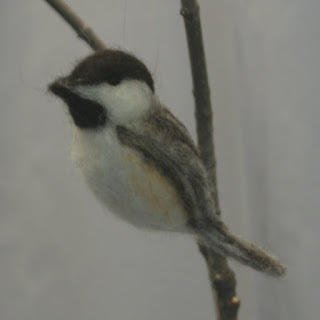 My first felted birds were atrocious, so if you like doing it, keep at it!